This topic will compile an official list of record of Weekly Disney Infinity Featured Toy Box Winners that are also a member of the Disney Infinity Fans forum. All of the moderators and forum members are proud of your success and that you are a resident of the Disney Infinity Fans forums. 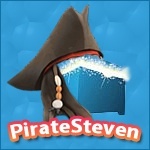 Forum members who have created a featured Toy Box will be recognizable when posting by the addition of the featured toy box rank in their profile as shown below. If you have been featured in the top 5 of a weekly Toy Box challenge or you know of a forum member that has won a challenge, please PM me with the info that you have on the forum member's Toy Box.